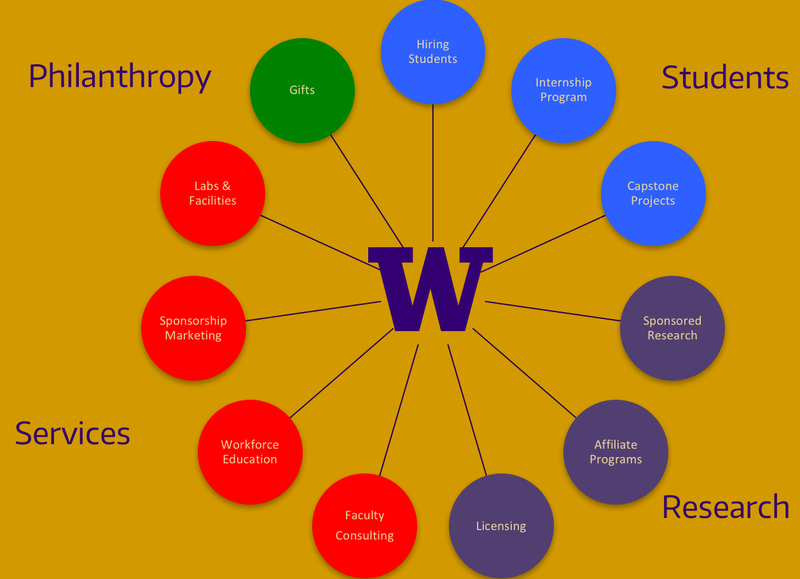 The University of Washington’s corporate relations team can help you build fruitful relationships with companies. Working with industry is quite different from working with foundations or federal funding agencies. Our team can answer questions, introduce you to companies, and help you structure your partnerships with companies. Stay connected with real-world problems that industry is facing. Build partnerships that can be invaluable when competing for large federal grant opportunities. Access SBIR and STTR grant funding. Create products and services that benefit society by working with companies to commercialize inventions from your lab. Give students who work on company-sponsored projects valuable experience and career opportunities. Earn licensing income from companies who want to license inventions from the projects they sponsor. Companies work with universities to advance their R&D efforts, tap student talent, and engage experts to help them achieve their goals. The diagram below illustrates the main ways companies engage around students, research, services, and philanthropy. Our team can help UW researchers and companies decide which pathways are appropriate for each partnership and work with the researcher, the company, and other UW colleagues to guide engagement strategies. Sponsored research projects: Company sponsors work directly with faculty to define custom projects. Each project requires a statement of work that describes the project scope, schedule, budget, and how the work is divided if it will be a collaborative effort. This plan must be submitted via an eGC1 so that it is approved by the department chair and dean, and then by the UW’s Office of Sponsored Programs. Company-sponsored projects are subject to indirect costs at the same rate that applies to federal grants. See the sponsored project quick guide for more information. Gifts: Some companies support the UW through gifts to departments, labs, and programs doing work that is of company interest. Our team will work with the company to document the gift. Since a gift is philanthropic, there are no contractual deliverables or intellectual property access. The UW does not assess indirect costs for gift support, and gifts may be tax-deductible. In-kind donations: Companies may also provide gift support through in-kind donations of equipment or software or through below-market discounts on its products. In-kind donations may be tax-deductible. Time: Corporate partners are often driven by near-term timelines and deliverables, which can make the terms of a project difficult to negotiate and meet. Agreement: Negotiating contract agreements with companies can be complex, particularly establishing a statement of work and negotiating terms for intellectual property ownership, indemnification, and publication rights. Confidentiality: It is important not to divulge sensitive information to a company before a nondisclosure agreement is in place. Once sponsored research is conducted, companies often want to hold information confidential or delay its publication in order to secure a competitive advantage. Careful upfront negotiation may be needed to achieve both the company’s goals and the academic goal to disseminate knowledge. Classified work: Corporations engaged in classified research may want to pass the secrecy and other obligations on to the UW. Careful contract negotiation and a classified or restricted work environment will be required. Project length: Length of corporate projects should take into account the contract status and expected graduation dates of involved students. Companies often prefer to fund projects one year at a time. Companies often want to put a non-disclosure agreement (NDA) or confidential disclosure agreement (CDA) in place ahead of in-depth discussions about a project opportunity. If you are presented with such an agreement, do not sign it yourself. Although the UW routinely completes such agreements with companies, only certain people at the UW are authorized to sign them. NDAs and CDAs for research project discussions are reviewed and signed by OSP; you should submit them for review with an eGC1. A corporate relations officer can work with OSP to get the agreement done. It is usually best to have an initial meeting or two with the company before starting work on an NDA. You want to first assess that the company’s interests are a good fit for a project in your lab and that the company can work with UW policies on publications and intellectual property. Also note that entering into an NDA always carries the risk of “intellectual property contamination,” where you learn something from the company that intersects with something you were thinking of doing but haven’t yet documented. In this case, the NDA could prevent you from exploring a new research area for several years. Intellectual property (IP) rights and ownership are important to consider for projects with commercial applications or non-UW partners. CoMotion handles IP issues, and faculty are strongly encouraged to disclose inventions to CoMotion and consult with them before discussing UW inventions or IP rights with anyone outside the UW. In most cases, the UW retains ownership of inventions and discoveries that arise solely from UW-conducted research, whether patentable or not. Sponsors are routinely granted a first right to negotiate with the UW to obtain a fee-bearing exclusive or nonexclusive commercial license to project IP on commercially reasonable terms. Faculty are encouraged to consult with the corporate relations team, CoMotion or the Office of Sponsored Programs before discussing IP or other contractual matters with companies to avoid misunderstandings. Faculty may direct companies to the quick guide with basic information about IP and other sponsored research terms. The Washington Innovation Advantage Program allows companies that sponsor research an opportunity to pay an additional up-front fee to fix financial terms for commercial rights to IP resulting from the project they fund. The UW, the faculty and the company must all opt in to the program.